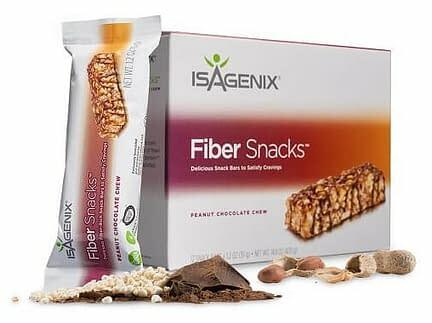 Isagenix Fiber Snacks | The Best Bar None! Available in Peanut Chocolate Chew and Honey Almond Crisp, Fiber Snacks are a delicious and gluten-free way of getting 6 grams of both high-quality fiber and protein into your diet. With 24% of your recommended daily intake of fiber per bar and absolutely no trans fats, Fiber Snacks are a great alternative to unhealthy candy bars, and fit perfectly into a balanced lifestyle. Keep a box on your desk at work and avoid the dreaded afternoon energy dip. Available in two tasty flavors in a box of 12 bars. 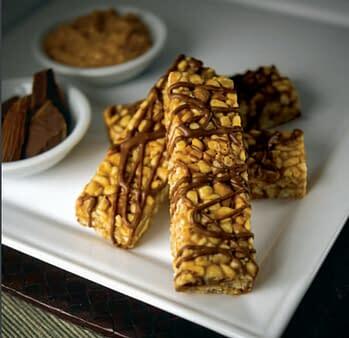 These filling snacks bars should be in everyone’s bag, lunchbox & car! The average North American gets nowhere near enough quality fiber in their diet. Not only that, a lot of ready-made food comes attached to dangerous trans fats, which can simultaneously raise bad cholesterol and lower good cholesterol. Fiber Snacks are a delicious, convenient way of adding quality fiber and protein to your daily meals, without the trans fats! Available in two mouth-watering flavors, Chocolate Peanut Chew and Honey Almond Crisp, every bar contains 6g of useful fiber and 6g of quality New Zealand whey protein. The fiber in Isagenix Fiber Snacks is made up of both soluble and insoluble varieties. Prebiotic soluble fiber feeds the healthy probiotic bacteria in your gut, promoting better digestion. The insoluble fiber helps to keep you regular, and feeling fuller for longer – great if you’re trying to shed excess pounds, but not feel tired or hungry. 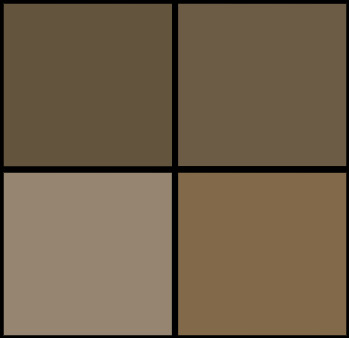 The protein in Fiber Snacks is sourced from trusted New Zealand farms, and milk from cows who haven’t been injected with hormones or anything else unpleasant. You’ll find 6g of protein in each bar, which is important for maintaining strong, healthy muscles, as well as for staving off hunger between meals. Interested in how fiber and protein help to fill you up for longer? Find out more. Each bar clocks in at just 150 calories each, are gluten and peanut-free and contain no dangerous trans fats. Keep a box on your desk at work, throw one in your gym bag, or into the kid’s lunch boxes. 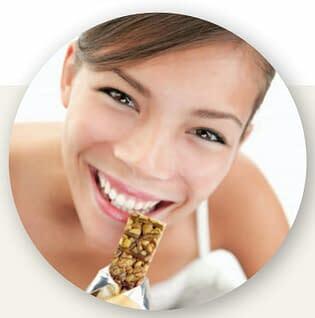 6g of fiber per bar – that’s 24% of your daily intake in a single, healthy snack. Prebiotic soluble fiber feeds healthy gut bacteria, promoting good digestion. Insoluble fiber helps to keep you regular and helps you feel full for longer. Protein helps to keep your muscles strong, lean and healthy. Together with fiber, it’ll keep you feeling full for longer, too. You can find out more about whey protein here. Both flavors are gluten-free (like many other Isagenix products). Fiber is important for keeping your digestive system regular and healthy. It also helps you to feel full for longer, and avoid unhealthy snacks between meals. Why add protein to Fiber Snacks? Proteins are the building blocks of muscle, and even if you’re not currently training, you still need protein to keep your muscles strong, toned and healthy. I have a peanut allergy; can I still eat Fiber Snacks? You can still enjoy the Honey Almond Crisp bar, although the Peanut Chocolate Chew bar does contain peanuts. Peanut allergy is one of the most common allergies in the world, although some children do outgrow their sensitivity. Can Fiber Snacks be used as a meal replacement? 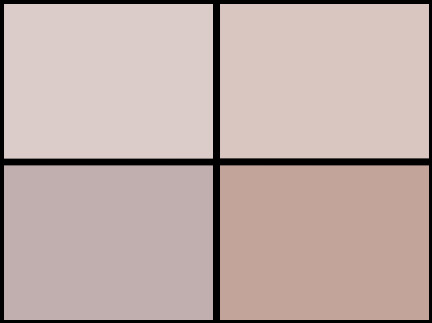 Fiber Snacks are intended as a between-meals snack. At 150 calories, they are not suitable as a meal replacement. Enjoy as part of a healthy, balanced diet. Fiber Snacks are intended as a healthy, fiber and protein-rich snack, but not as a meal replacement. Keep hunger at bay, resist unhealthy options, and increase your fiber intake with Isagenix Fiber Snacks.